Give us a break, Netflix: It seems like the streaming service unleashes dozens of new programs a week, many in the kid category. Yes, Netflix is an ideal option for screen time—no commercials, multiple episodes immediately available—but how can you plow through dozens of titles to find the ones your kids will actually enjoy? The ones that might actually be educational, or at least entertaining, and not just glorified toy commercials? (Looking at you, Barbie videos.) Once again, we turn to our A.V. Club parent panel, who reveal the favorite Netflix shows of their own offspring. My daughter is obsessed with buses. In fact, she regularly informs me that she is a bus. While her twin sister busies herself with some fairly standard Frozen roleplaying, I often have to tuck the other one in at night by putting her into her “garage.” So naturally, she also wants to watch buses on TV. Of her two favorite shows, I simply can’t endorse Tayo The Little Bus, a borderline-nonsensical South Korean cartoon that boasts little to no educational value beyond a shaming message of working harder (along with one of the most annoying theme songs you’ll ever hear your kid singing at 1 a.m.). In a continuing effort to get my kids to cook (and eat non-beige food) more, we watch a lot of cooking shows, with MasterChef Junior being a big hit, for obvious reasons. But only one cooking show has made us laugh so hard it even brought my husband to tears: Nailed It! The show brings together amateur, admittedly non-expert cooks and gives them impossible baking tasks, usually involving copious amounts of fondant and Rembrandt-worthy art skill. Any non-professional chef would fail, but some of the efforts are so bad, you wind up cheering for the ones that are even halfway decent, and at least mildly resemble the jungle or castle the bakers were supposed to create. Host Nicole Byer and head judge Jacques Torres are nothing but kind to the competitors as they struggle with these Herculean tasks. If there’s a show I’m going to have my son watch when it’s summertime, I’m going to pick one that at least emphasizes going outside and enjoying the weather. (I live in Chicago so we only get about two months of sun.) And that’s why Netflix’s Spirit Riding Free is the perfect show. Apparently it’s a spin-off of the 2002 animated film Spirit: Stallion Of The Cimarron, which starred the voice talents of Matt Damon, but I wouldn’t know. I never saw the film, and I don’t need to to enjoy this wonderful series. It takes place in the frontier times and focuses on Lucky Prescott—a tween girl from the city who moves with her dad to a small remote town in the middle of nowhere. While there she befriends locals Pru and Abigail while also forming a bond with Spirit, the aforementioned horse. If there’s one problem I have with the show, the title is Spirit, when really the show is about Lucky and her friends. It’s easy for stuff to get lost in Netflix’s content firehose. For instance, the service announced True And The Rainbow Kingdom way back in July of 2015, but the show only arrived, with little fanfare, last year. 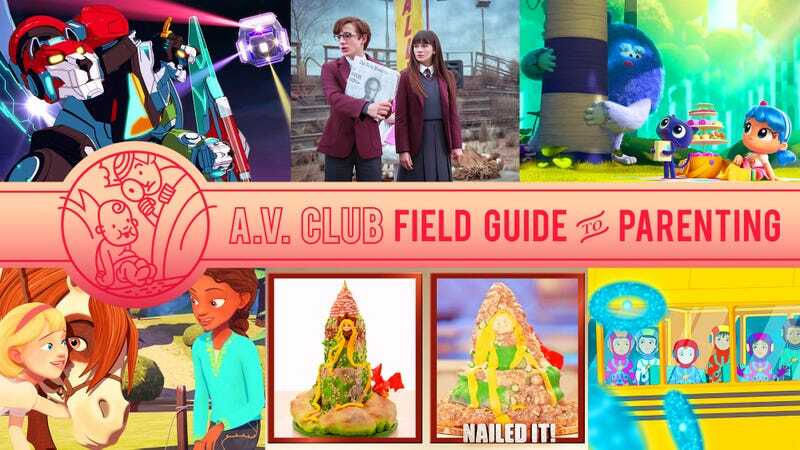 Helping the show stick was its prime real estate in Netflix Kids’ genius/dangerous search bar, where images of characters from shows appear so little ones who can’t read can still find what they like. My 5-year-old daughter, who loves cats so much she insists she is a cat, was immediately hooked by the image of True holding her cat/sidekick, Bartleby. This series is definitely not for younger kids: An overwhelming darkness and theme of children (even a baby) in constant peril is disturbing. Middle-schoolers, though, likely will not be able to get enough of it. The Series series offers a storybook world as stylized as a Wes Anderson movie and as grim as Grimm’s Fairy Tales, as the Baudelaire orphans (Violet, Klaus, and baby Sunny) traverse an unwelcoming world, constantly hunted by the evil Count Olaf, who wants to get rid of the kids so he can have access to the fortune they’ll eventually receive. Neil Patrick Harris is downright revelatory as this villain, fearlessly dressing up in myriad hideous disguises from a crusty sea captain to a deranged doctor as he attempts to infiltrate the poor kids’ lives. Fortunately, they have some advocates, like Sara Rue as a resourceful librarian, Joan Cusack as a benevolent judge, and Nathan Fillion as a dashing secret agent, the brother of Lemony Snicket himself, our expert narrator personified by Patrick Warburton.